Every incarnation of Pet Sematary, from Stephen King’s novel to the two film adaptations, start with a terrific premise for a horror story but ends up favoring cheap scares and tired genre tropes over a chilling exploration of the themes it so clearly sets up. In fact, the story beats of all three versions are exactly the same. This time: A doctor named Louis (Jason Clarke) and his family move to a small town. The family cat, Church, dies. With the guidance of a weird old man named Jud (John Lithgow), Louis buries Church in the mysterious plot behind the pet cemetery, and is shocked to see that Church is back. However, Church’s violent behavior forces Louis to get rid of him. After a tragic accident causes the death of one of Louis’s children, Louis tries the same burial trick and the result is even worse. For a parent, even the thought of losing one’s child is cause for many nightmares. In Pet Sematary, that premise to explore—what a parent is willing to do for their child—is executed within a viscerally disturbing horror setting. To what extent would a parent convince themselves that everything’s fine, even when the child begins showing psychotic behavior? How much would they sacrifice to spend more time with their offspring? Pet Sematary throws all that away for the simple shock value of turning a child into a slasher/zombie combo. 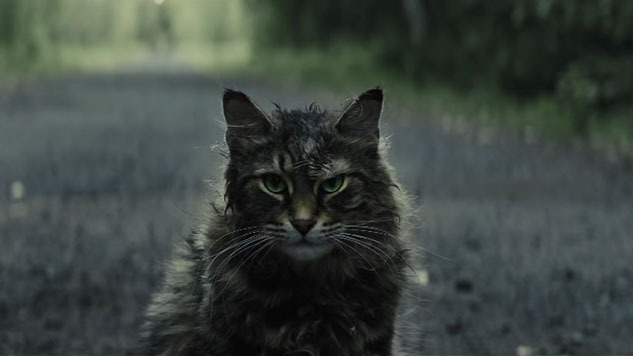 The 2019 Pet Sematary follows the 1989 film down to the specific ways some characters are killed—except for one specific change that could have added a new dimension to the third act, but ends up as a superficial attempt to separate the project from previous iterations. Jeff Buhler’s script fills in some new details and character development to give more credibility to plot holes, motivations and extremely stupid decisions made by the characters, but Laurie Rose’s cinematography and Todd Cherniawsky’s production design disappoints with a flat and lifeless look. Compared to the 1989 film, 2019’s Pet Sematary is a minor step up in narrative, and a minor step down in technical efficiency. The two kind of even out one another. In the original story, Jud comes across as the real villain, since he fully knows the dangers the burial ground poses and takes Louis to bury Church anyway. Here, he’s given more detailed motivation as to why he’d do such a reckless thing. Just like in all other versions, Louis’s wife Rachel (Amy Seimetz) navigates a bizarre sub-plot about her once bedridden and now dead sister (Alyssa Levine) haunting her memories. Instead of superficially injecting horror into a film whose first half doesn’t really contain any out-and-out genre elements, the new script Rachel’s travails to add some layers to the character. She blames herself for her sister’s death and in turn, her own fear of death motivates Louis to bury Church so she won’t have to explain the cat’s demise to their daughter, Ellie (Jete Laurence). Unfortunately, both films are guilty of offensively depicting a sick person as a movie monster simply because of her illness. Director Mary Lambert’s 1989 adaptation wasn’t a visual masterwork, but it was able to convey a sense of dread through a grainy aesthetic and exterior locations. In 2019, Rose’s digital photography carries a dull, grayscale color scheme and an overall depthless aesthetic, looking like an early ‘00s basic cable drama show filmed with soundstages and gaudy green screens.